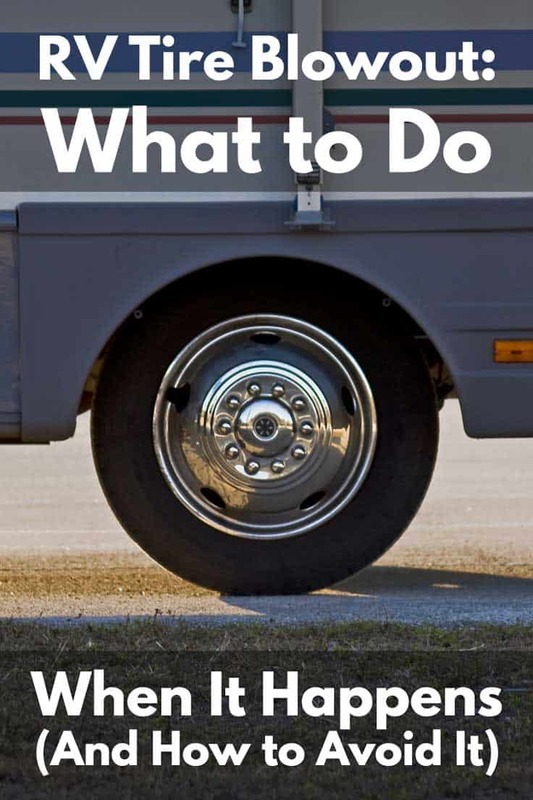 Do you know what to do if your RV tires blow out? While you can hope this will always remain a hypothetical situation and not a real one, it doesn’t hurt to be prepared. That’s why we’ve researched and put together this guide for you. Keep both hands on the steering wheel and try to keep the RV going straight ahead. Avoid strong corrections or jerky movements. Do NOT hit the brake! If conditions allow, speed up to get more control over your vehicle. Get to a safe zone where you can pull over and then very gradually slow down to a stop. Were you surprised by this answer? Do you want to know why you should speed up instead of slow down? In this article, we’ll tell you everything you need to know about RV tire blowouts, including how to prevent them. If your RV tire blows out, your goal is to keep your vehicle going straight ahead, rather than getting pulled to the side. Since you basically just lost one of your tires, that side of the RV is going to sink down and pull the entire rig in that direction. 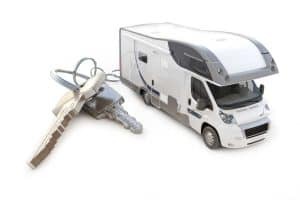 You need to fight back against that pull to keep the RV going straight on the road. For that, the first thing you need is to stay calm and have both of your hands firmly holding the steering wheel. That’s another good reason to always keep your hands on the steering wheels in the right position. Next, you need to provide your other wheels with more force, so they can fight against the pull of the flat. The best thing you can do is counter-intuitive: speed up. This may go against your natural instincts, but speeding up can save your life. Depending on which tire goes out, your RV will be pulled in a certain direction by sideways force. For instance, if it’s one of the front tires, then it’s the front of your RV that will start to move out of your control. If you start slowing down, you’re lessening the forces which propel the RV forward, in comparison to the new force pulling it to the side. As the RV careens at an even sharper angle, it becomes practically impossible to control. Correcting the issue can’t happen at this point, and your vehicle could tip or crash. Both could be deadly. When you pump the accelerator, the drive wheel gets more power. This lets you correct the careening enough that you can pull over before you crash. Pulling over is paramount. While that little burst of speed will overcome the sideways forces, your tire is still blown out, so you can’t drive on it. You need to get to the shoulder or side of the road ASAP, call the police or roadside assistance, and wait. How fast is fast enough to avoid crashing or tipping over? The point is to accelerate in order to avoid losing control over the vehicle. It doesn’t have to get very fast or last for long. A few seconds of acceleration will help you regain control and then you can gradually reduce speed until you find a safe place to pull over. It’s another good reason to drive slowly to begin with – and keep a safe distance from vehicles ahead of you. If you’re driving slowly when the blowout occurs and there’s no vehicle in front of you, you have more leeway when accelerating for the next few seconds. One user on the RV.net forum who had a blowout said they drove 65 miles per hour. Depending on where you are, you may go faster or slower. You may also be wondering what would happen if one of the rear tires blew. It’s actually less likely for you to feel the tire pop due to the location of the rear tires. You’ll certainly know you’re having tire trouble because your vehicle will begin to careen. The good news is that the careening won’t be nearly as extreme. With both front tires working, keeping your vehicle from veering sideways is far easier. You still need to get to the side of the road as soon as you can, though. A blowout could cost you your life. And blowouts do happen in RV’s and other large vehicles. An ounce of prevention is worth a pound of the cure, so we’ll discuss prevention in a minute. But – you can never fully prevent a blowout. Even if you keep the best possible care of your tires, a blowout can still happen due to road conditions. Keep your hands on the steering wheel and your eyes on the road. Load your RV properly and don’t tow or haul more than it can safely handle. Drive slowly, keeping road conditions and the weather in mind too. Keep a safe following distance, and then some more. It’s not just about needing room to brake – it’s also about needing extra room to speed up in case of a blowout. Make sure every one is buckled up when driving. Always. If someone needs a potty break, they should wait until you’ve safely pulled over. Ignoring any of these rules can cost you your life, or the lives of your dear ones, should you experience a blowout. And take a look at your DMV’s guidelines for emergency situations. 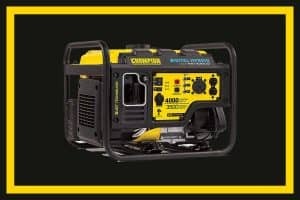 They cover blowouts and other issues as well. What Causes RV Tire Blowouts? The first step in preventing a blowout is knowing what damages RV tires. Here are some of the culprits. 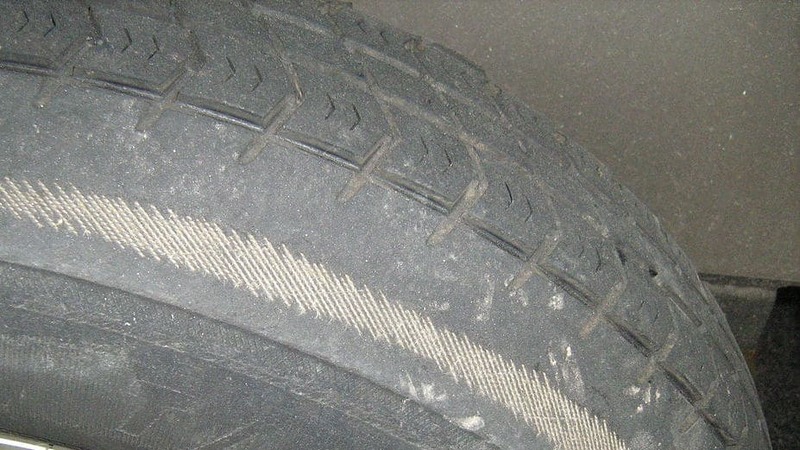 An underinflated tire is at risk of exploding. How, you ask? The lack of air in the tires allows heat to get in there. More heat will also build up as you drive. The heat expands the little air in the tire. As the pressure builds, the tire will explode. 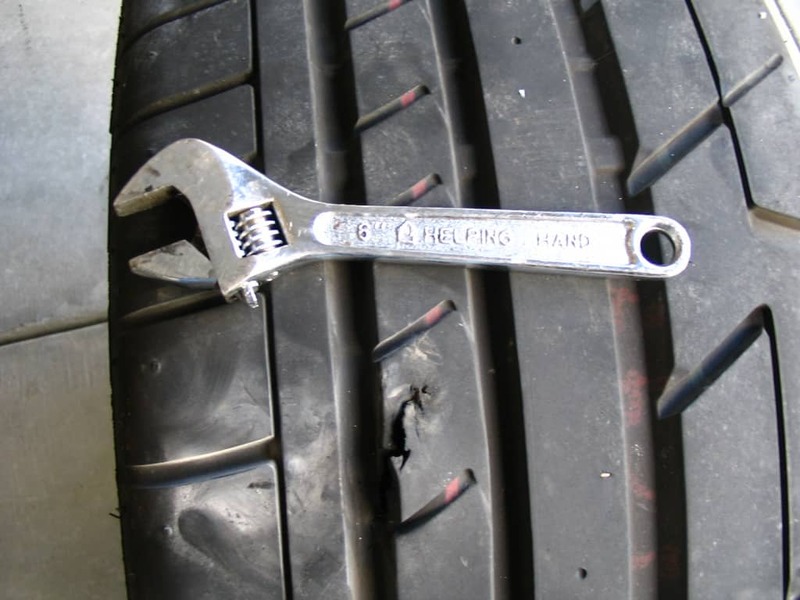 Few things will pop your tire faster than driving over a rusty nail or other sharp objects. While you can’t avoid every last hazard on your travels, do your best to dodge road debris. If you have one or two new tires and a few older ones on your RV, your tires are wearing down unevenly. All it takes is one of the old tires giving way and you could have a blowout. Another reason to check the health of all your tires is low tire read. 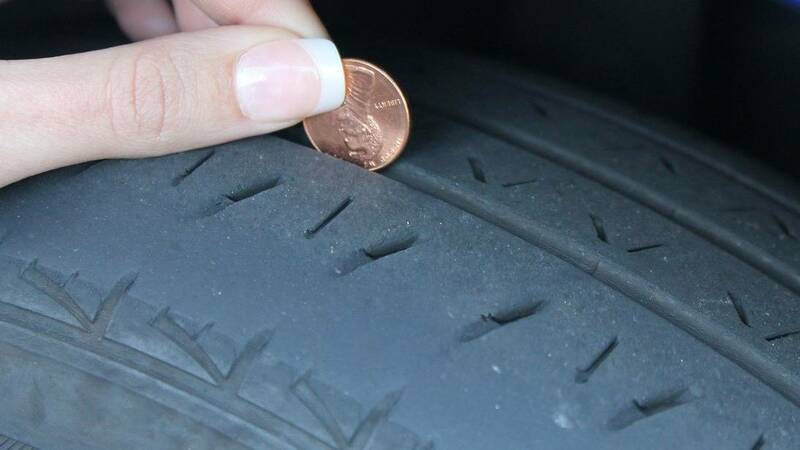 If your tires are below 2/32 of an inch, then they may have lost too much tread. Tires can become worn down at best and bald at worst. If you have low tire tread, driving in ice or snow becomes extremely hazardous. Rainy conditions could lead to hydroplaning. Finally, if you leave your tires on too long and they sit exposed, they could develop dry rot. The weather can wreak havoc, cracking the tire rubber until it’s brittle. It’s only a matter of time until the tire blows out from there. Read more: What Should the Tire Pressure be on an RV? Going through an RV tire blowout can be a terrifying experience. After all, handling the situation is a matter of life and death. It’s one thing to have a tire explode or give out in a car or truck and another matter entirely when it’s a lumbering vehicle that’s several thousand pounds. While we can’t guarantee you can avoid all future tire issues, by following these tips and suggestions, you can be safer on the road. Ideally, you should check your tire pressure before you embark on all your RV adventures. If you’re on a long voyage and you take a break, it doesn’t hurt to test the pressure then. Once you reach your destination, you should again check your pressure. Make this a regular habit. Another great time to test your tire pressure is during winterization. Before you send your vehicle off to a storage facility, check its pressure. Then, once the spring arrives and you retrieve your RV, test pressure again. You should also come back to the facility (if you can) and check tire pressure monthly. Testing tire pressure is dependent on the tires being cold. That means you should not have driven the RV for at least a mile. Otherwise, the tires won’t be cold enough for accurate readings. The pressure per square inch (PSI) of tires is always more when they’re hot. Your reading could be off by 10 to 15 PSI, which is enough to make you think your tires may be underinflated or overinflated. As we mentioned earlier in this article, if one of the tires doesn’t have the same pressure as the others, then wear and tear does not occur evenly. The newer tires wear down more slowly than the old one. That older tire then becomes a prime candidate for causing a blowout while you’re driving. Both overinflating and underinflating the tires can cause them to explode. We explained what happens with an underinflated tire, but what about an overinflated tire? It’s a similar concept. The pressure in the tire continues to grow as the tire gets hotter from driving. The PSI will increase by one pound as the temperatures go up 10 degrees Fahrenheit. That may not seem like such a big deal, but if your tire is already dangerously overinflated, all it takes is a couple of extra pounds of pressure and your tire explodes. Worn-down treads are another contributing factor to RV tire blowout, so you must monitor them. To do so, you can use the coin test. You grab a quarter or a penny and slip it between the grooves of your RV tire. The coin should be upside down so the head on the face side is obstructed by the tread. Does the coin stay? If so, your treads are okay. If not, it’s time to replace them. If you don’t already have one, you might invest in a TPMS system yourself. Like the RV.net poster said, they can’t prevent every blowout, but they could help. This one from Denso is available on Amazon. It has a high rating and is available for less than $50. Lastly, we recommend you always distribute weight evenly on your RV. When there’s too much weight to one side of your vehicle, the tires on that side have to work that much harder. The added strain could cause them to explode or otherwise blow out. All RVs have a max weight capacity. By surpassing that, you’re putting yourself in danger. In an RV tire blowout, it’s always best to speed up to get to safety. This counteracts some of the sideways force that threatens to crash your vehicle. Although a blowout can be scary, by keeping a level head and remembering to put your foot on the gas, you can park at a shoulder and figure what to do next. 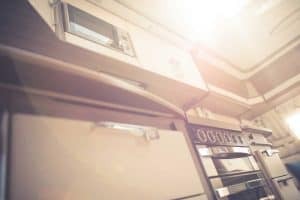 Previous PostWhy Does My RV Smell like Sewer (Or Rotten Eggs)?